OSR #5-2007 Here we go Again! Well sports fans, our newly elected New York State Governor has appointed his choice to head up the NYS Department of Environmental Conservation. The winner is Assemblyman "Pete" Grannis of the island called <?XML:NAMESPACE PREFIX = ST1 />Manhattan. Grannis is said to be a "champion" of many environmental causes, many of which are noble efforts. There is a big question lurking in the shadows regarding the intentions of the new "Commish" which has to do with possible anti hunting legislation. It seems that Grannis has introduced NYS Assembly Bill 1850 which would revise the state definition of animal cruelty to include killing or injuring wild game and wild birds. If passed, this revision will be used to make legal hunting and trapping criminal offenses so says the US Sportsmenâ€™s Alliance. Similar ambiguous worded bills have been defeated by sportsmen in other states. It definitely sounds to me like we have just hired a fox to guard the hen house. If you hunt and live in NYS you had better keep an eye on this one. It never gets easy does it? Any way "Pete," we will be watching to see how this plays out. On a more pleasant note we are getting closer to the start of the Lake Ontario trolling season, and I for one just canâ€™t wait. That is why while I am here in Florida I will do some practice trolling for sailfish. No downriggers, no 6 pound test, just surface presentations for the acrobatic sails. Like they say, someone has got to do it! 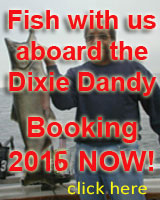 As I stated in a previous blog, it looks like 2007 is going to see plenty of big fish. There are plenty of plump baitfish schools roaming the depths and a very mild start to our winter will only enhance the condition of the forage population. It is really looking good for 2007. 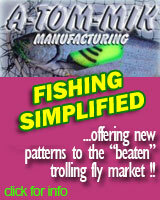 I have joined the Field Test/ Pro Staff Team sponsored by A-TOM-MIK Trolling Flies. 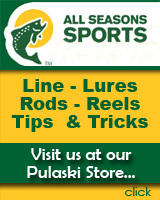 This company has quickly become a major player with regard to trout and salmon trolling on the Great Lakes. It is a story of a young man with a vision and a tremendous work ethic, and a belief that he really could build a better lure. Founder Tom Allen has done just that, and has created a small business success story. In a few short years the A-TOM-MIK name has become synonymous with catching plenty of big fish. His assortment of offerings is based upon years of on water experience. Testing is crucial and something a small as an individual tiny color addition turns an OK lure into a "killer" I look forward to my involvement with this company and its continued growth.